Computers can be both a blessing and a never-ending source of frustration. With the internet, Skype, email, and other software programs, computers are great for accessing all sorts of information and the world around us; hence, it's no surprise that these machines have become an integral part of everyday life. However, constant computer use can cause an infinite number of problems for users. Viruses, malware, and various other problems can cause computer performance to slow down to a halt and could even pose a security risk for the owner. With all the personal information stored on computers nowadays, a security leak could spell disaster for anyone who might fall victim to a leak or identity theft. Nevertheless, there is hope. With the proper maintenance and care, a computer can run optimally and protect all of the sensitive data contained on it. Many people think that all of this is difficult, time-consuming, and impossible to maintain, but with a little guidance anyone can make a computer run as good as new. and more for you to unlock! What's the best part? Both PC and Mac are covered for everything. 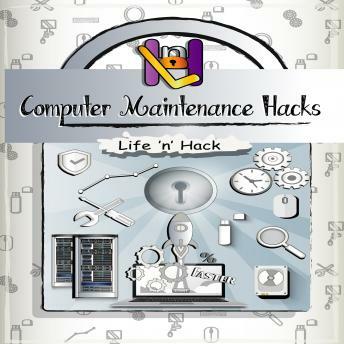 So if you've ever yelled at your screen for taking too long to load or worried about the security on your computer, "Computer Maintenance Hacks" is the answer to help you take control of your computer issues.